Grayson was out foraging and chopping wood as he needed supplies, his camp was set on the outskirts of Bravia. He woke up with a chill on the air and snow on the ground. He shook his head and wondered where the sudden snow and chill had come from. According to the proverbs and some of the people he had spoken with it was not supposed to get cold as it had gotten over night, so Grayson dressed accordingly and headed out of his tent. The runes on his body began to glow faintly as the weather tried to get to him but couldn't. He grabbed his bag for foraging as today did not seem to be a day for wood chopping. he headed out further than he had been so far as to find something new this day. He walked along picking his way through the snow and trees. Grayson found a small batch of shrooms, stopping to pick them he noticed that it had gotten a bit chillier. He pulled his cloak around his body a bit more and continued on as he did so he felt a warm pulsing sensation in the small ruby pendant that Alex had given him. Grayson looked down at the pendant and noticed that there was a lessening of some glow coming from it. He walked forward a few steps looking around to see what he could see; turning back around and heading back on his footsteps he again felt the pulse, looked down and saw it pulsing this time, last time he felt it and this time he had seen it as well. 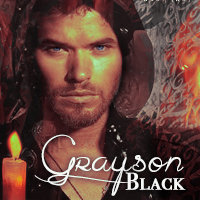 Grayson grabbed what he had been aiming to get when he felt the second pulse. He turned back and headed out across the open plains that looked like it had once been fields. He slowed here and there picking up what was bits and pieces of old farm tools. Once he picked up a couple pieces of old broken lead ropes and some and what appeared to be reigns. 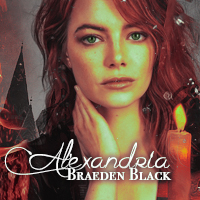 Grayson shook his head as he walked along wondering what he was seeing and wondering at why he had felt that pulse in his pendant that Alex had given him. Grayson came over a rise and there before him stood a castle, albeit run down, but a castle none the less. There were buildings on the outside of the walls and a huge gate, he stood looking at the place wondering whose castle was it? He started walking closer and inspecting the area as he did. As he walked his runes glowed slightly letting him know that some one or something was watching him. He continued walking scanning the area as he did, he used some of his mage sight to allow him to see a bit further than he would be able to normally. He quieted his foot steps and started walking in the shadows of the buildings he came across, his runes grew a bit brighter so he slowed down and looked around him, suddenly something hit him in the back of the head and shattered or exploded would be a better word i presume. Running his hand over the back of his head he brought forth snow, it seemed that some one had hit him with a snowball. He turned and saw a small figure darting behind a building as he started after the small figure another snowball hit him. Kids it had to be kids, but what were they doing way out here He made a few snowballs himself and then sent them in different directions, stepping out in the open caused some giggles and then some surprised gasp as snowballs landed on kids. Grayson called out, " I give up" he held his hands up and watched as snow clad kids stumbled out from one was pulling a jacket off screeching and trying to get the snow from down her back.That's cheating she screamed she seemed to be in her early teens and the other two were younger boys who were giggling and laughing as they wiped snow off their faces. "Who are you kids and what are you doing out here?" She threw her jacket back on and shivered a bit as she smartly remarked we live here She walked closer and then asked Who are you and what are you doing here? My name is Grayson Black and I was out foraging and chopping wood when i came upon this place, What is this place? He looked up at the wall and then around the area. The girl said, My name is Rena, this is Bart and Clyde and this, she spread her arms out, is the Braeden Caisle Castle. Grayson stood awestruck as things started to click into his head. I have to go, but I will be back in a day or so! Grayson started glowing and then disappeared from in front of the kids. Appearing in their house Grayson said, I found it and then dropped unconscious in the floor. Alexandria wasn’t happy. Some would say she was a tad bit grumpy most days. Why she didn’t know. What she did know as she was feeling sick all the time and Grayson wasn’t here to snuggle up to, even Sybil had disappeared. That darn cat was just as moody as she was and getting fat didn’t help the cat either. Alex wanted to laugh but it seems she rather throw up everything she ate. "Had I awaken in some parallel universe or something," she asked herself trying her best to hold on to her food. Her magick was so off center some spells backfired not to mention the aches her body parts had. 'Who has aches in their… their bosom… yea sure let's call them that,' she thought as she tried another spell. "It’s going to work… it’s working… it’s … nope, it’s nooo…" she ran towards the door to toss the potion when Grayson appeared just in front of her. I found it, he said dropping unconscious in the floor. Alex didn’t have time to stop before she tripped over her unconscious husband dropping the potion. She tried to use her wind ability to push it out the window but it was too late. "No… no… no … no." Alex knew she couldn’t move Gray without help so she opens a portal underneath him and dropped them both out of the house an into the pond close to the house. Just as the potion combusted setting the house on fire. "Sorry sweetie" she said pulling Gray out of the water. She didn’t care the house was burning. She did care her sweetie was unconscious and on the ground. Pulling him into her lap, "darn you’re big and heavy", she said with a big smile. "I'm not complaining just saying it you know right.." trying to read his emotions. "Darn you!" The one person she would fall in love with and marry is the one person she could not read, emotion or mind. "What do you mean you found it?" she asks magically transporting them somewhere warm, and indoors. It was cold and they were wet. “You’re lucky I didn’t send us somewhere atop of a mountain, or in it. YOUR WELCOME!" She grumbles as she started another fire. This one was at least in a fireplace when she realized where they were. The one place she had not been since her grandfather died. Her grandfather Adonair school of magick. She didn’t have time to feel the emotions she was feeling. Her home was burning and her husband was unconscious. "What… don’t say it" she mutter. Finding what she was looking for she peered into the glass mirror and watched as the last of their home went up in smoke. Sighing she realize she couldn’t be mad at anyone but herself. "Why all of sudden was her magick so out of sorts." Just as she asked that question her runs started to glow. She felt something for someone trying to reach out but it couldn’t not here. Her grandfather place was warded against bad magick or any magick other the families or students welcome into the school. "So who was trying to reach out? and what had he found? "She looked back at her husband know that would have to wait until he woke up on his own. Grayson dreamed as he lay sleeping on the floor of their house. He dreamed to remember things and this time it was about the pendant that Alex had given him. It had glowed when he had crossed some unseen border, and now he remembered why. It was the blood of the Braeden Caisle family, it was attuned to some spell set by long dead family member. It must have triggered the spell when he passed into the lands of Braeden. As he remembered he thought of the children he had met and wondered at how they had lived in the lands and had no issues, none that he could see anyway. After some much needed rest and replenishment of his energy's Grayson began the process of waking himself up. He slowly sat up and expected to be in their bed or on the couch at home, but that was not the case. Alex Why are we in?He looked around for a few moments and realized he was still in the floor and not on something comfy and that it was not the house, he had not been in the building in many a day. Grand Father's old school for gifted students! Slowly he stood up and looked around the room and saw her looking upset out of the window. He walked up behind her and gently laid his hands on her shoulders and looked out the window at where she was watching. Seeing that she was watching what appeared to be their house and the tree it was built in burning down he asked, What happened? He had great news to tell her but would wait for this story first as she seemed troubled by a few things and he was not one of them as it seemed. He looked at Alex and noticed a few little things that made no sense to him, She had THAT glow about her and seemed like she may have grown bigger in a couple areas, not a lot but enough to give one notice that had not been at home as much lately and may have needed to be. He shook his head that glow was likely just the nearness of each other and their runes reacting to one another. He waited patiently to hear what she had to say. Alex heard Grayson talking but her mind didn't respond as fast as she usually would have. "I... I happened." Looking pale, her stomach tossing and turning. She did what she could to talk and not vomit. "It seems like something is wrong with me with me. "She took a deep breath then continued talking. "I can't seem to get my powers to act right. I'm using fireballs! Fireball! I don't have fire magic! and my air or wind element is making flowers! Flowers! Flowers!" She looked at her hands then back at their burning home. "I was just trying to make a potion to help me feel better when it combusted. She started walking around trying to explain things and not get emotional. Her magick goes crazy when she emotional. 'Sybil is missing! My... my... she pointed to her upper body. They hurt like crazy. I can't hold on to any food and I feel like a bloated body. [/color] Alex started crying. I don't cry! She was so emotional she looked at Grayson then threw up on the floor. " Sorry! What is happening to me,” she asks still crying. Just then a mop and bucket came from the cupboard to clean up her mess. "At least here I don't have to use spells to clean up. I'm afraid if I did I could burn this place down." Not really possible since her Granddad used a spell to prevent that from happening. Alex found a seat and plopped down in it. "Maybe it was the basket of strawberries I ate! Or something I ate days ago which was strawberries and cream. I seem to be craving a lot of strawberries lately. Looking up at Gray she tried to smile. "I wasn't trying to burn down the house especially with me and you in it. I just want to feel better and get my magick to working right!" Just then she remembers his last words. "By the way, what is it you found and where have you been. You know you been missed, then she grabs her tossing stomach and wishes for something to drink. Grayson smiled as she seemed to get a bit annoyed, I was out foraging and looking for stuff and got caught up in a snowball fight with Rena, Bart and Clyde! That was fun I may have cheated just a little, well a lot! He smiled at her and then grinned, Any way I found the castle, the Braeden Caisle Castle! I was wondering through the woods foraging and chopping some wood when this pendant you gave me started to glow and feel warm. He pulled out the ruby pendant that hung around his neck. He let it dangle onto his shirt for a few as he continued, I tested the theory a couple times, i crossed back and forth of the area and each time i would pass it would glow and get warm. So Finally i moved on just kind of looking around. I came across old farm equipment left in the fields, areas that look like they had been farmed at one time. I came up a small hill and as i topped it there in a small valley below was this huge castle and walls and such. It was definitely a rundown place like no one had been there for years. I made my way down the other side of the hill towards the castle and things started to pop up on the outside of the walls, looked like old stables and old farm houses that some one would use to keep a place this big running. Well just so seems as I did i felt like i was being watched, and suddenly i was pelted with snowballs from a couple different places, but there was no one around. Anyway i may have used magic to locate and drop snowballs in the faces of the boys and down the back of the girl's shirt. She was the one that told me it was the Braeden Caisle Castle! Then i mustered up the strength and teleported out to the house. You know the rest! He looked at her again and saw a couple things that he had not noticed before She had gained a bit of weight around her midsection and it seemed she may have had a bit of a glow around her. He leaned over and kissed her then asked, when is the last time your powers acted like this? Better question is have they ever? He had a thought but wanted to be sure so he asked, Is Grandmother Willow still around? I think we may need to have a talk with her!